One of my father’s favorite expressions is “Up the Wazoo.” Like a lot of the things Gene says, this expression is neither questioned nor seriously analyzed by either me or my brother. As a youngster growing up on the family ranch in western South Dakota, the context of the expression always left me with the impression that the wazoo was either a shallow river or an inviolable orifice in a guy’s body. A place not to be mentioned in polite company and a place you didn’t want anything to be up. Today I found myself literally and figuratively up the wazoo. 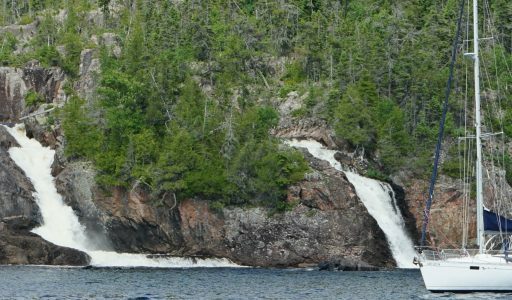 After being holed up in Old Dave’s Harbour on Otter Island for several days due to inclement weather, Julie and I saw a weather window open up in the afternoon and we made for our next destination some 30 miles up the Canadian coastline: Oiseau Bay. Now oiseau is a French word for bird. 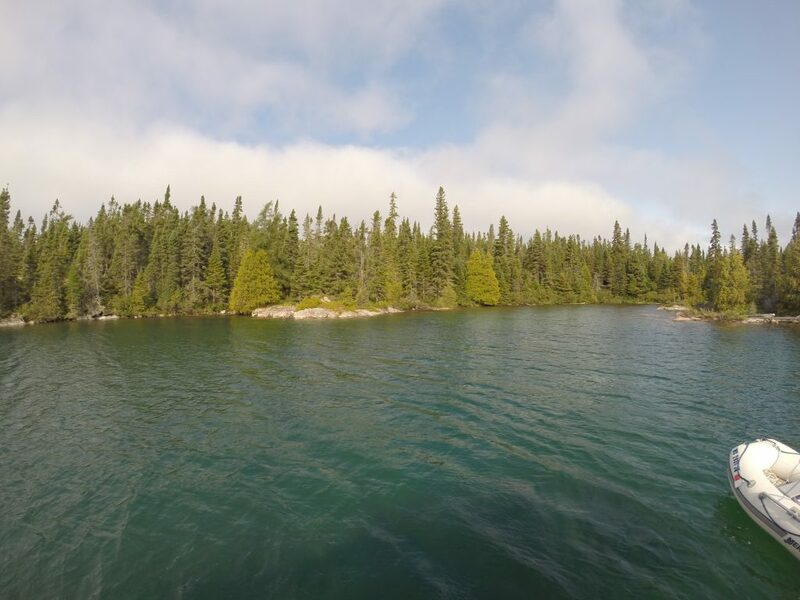 Oiseau Bay is a nesting area for a large number of birds. I studied French in college and I can stumble around in that language well enough to get by in most French speaking countries. I may not always get my verb conjugations right, but I generally know enough about the language to pronounce things fairly correctly. That’s important in an age in which if an immigration officer at an airport in a Francophone country asks about the nature of your visit, you want to be sure you say you are a “touriste” and not a “terroriste.” The two words sound very similar in French and one is generally more welcome than the other. Canada is a bilingual country. Most of the country speaks English, but it had a long history of French involvement, and one of its ten provinces is Quebec, where French is the dominant language. In order to make the Quebec population feel wanted, all Canadian signs and domestic product packaging is printed in English and French. Now this is off-putting to the average rural Canadian redneck, so they take pleasure is mispronouncing French words every time they get a chance. 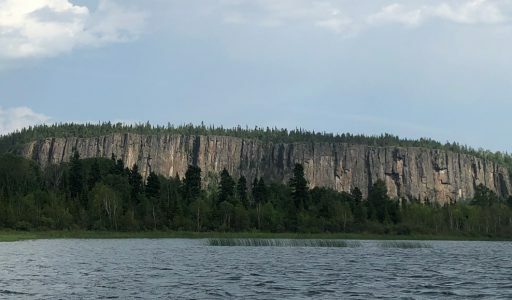 Oiseau, which is correctly pronounced “wah ZOH” is almost universally pronounced “wha ZOO” by sailors and fishermen along the east shore of Lake Superior. After nearly five hours of bouncing through three-foot swells we pulled into Oiseau Bay a little tired and made our way to Dampier Cove to anchor. 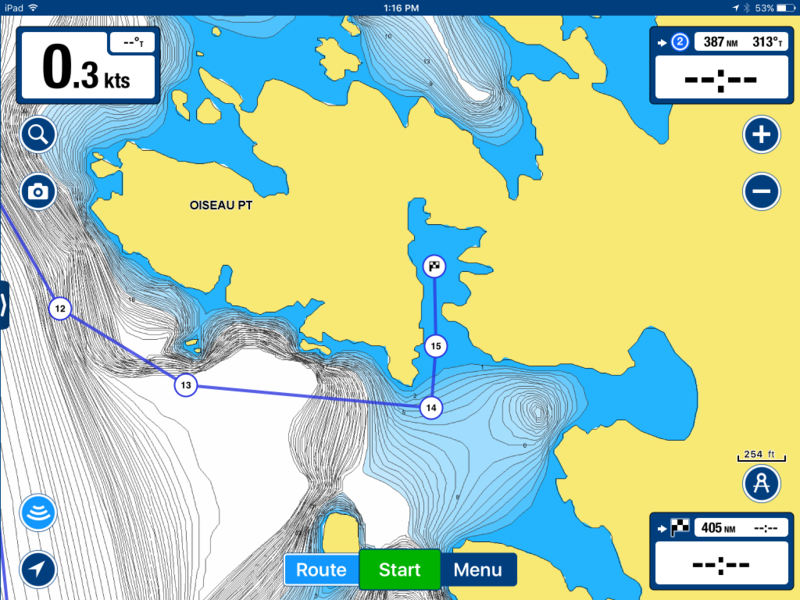 I was at the helm, closely following our Navionics app course Julie had programmed on our iPad. 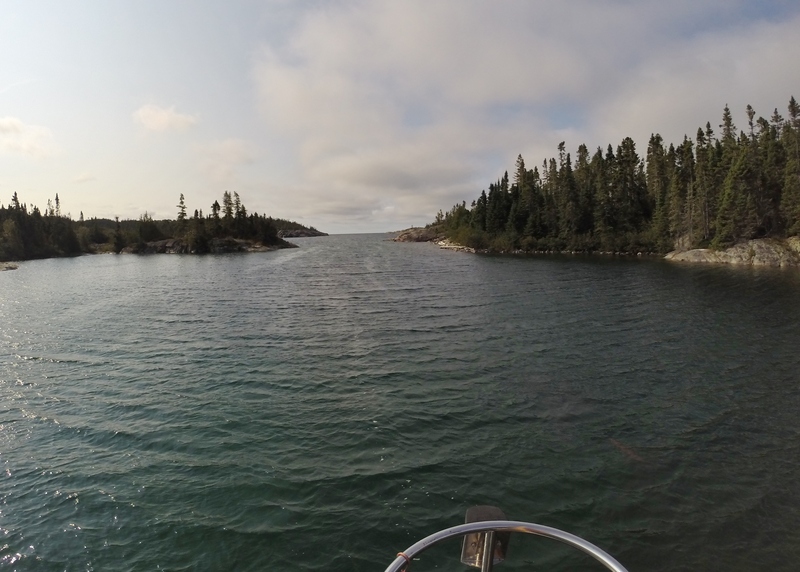 Julie was on the bow pulpit to watch for shoals and unmarked rocks—which are rife in these waters. As I approached the end of an island and was making my way around it, Julie suddenly calls out “shoal ahead!” and I see the depth rising rapidly on our depth meter. I immediately reversed course, which prompted the Navionics system to start spinning wildly and zooming in and out. What was up on the screen was suddenly down. Then sideways. I tried to get a fix on where I was supposed to go, but the GPS app was in a total panic. So I backtracked and headed for deeper water, trying to remember where I had come in to avoid keel crushing rocks and shipwrecking shoals. 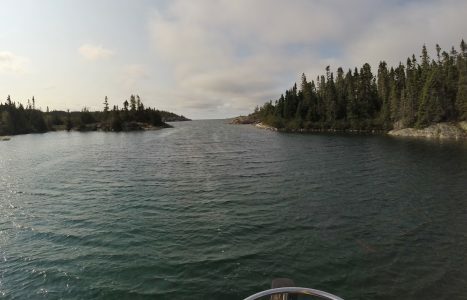 We scooted back around the point that separated Dampier Cove and a smaller, more accessible anchorage called Nicols Cove, which proved to be a calm and totally charming little refuge that allowed us to watch a waxing moon rise through a narrow channel and later, watch ghostly northern lights morph across the northern skies. Anyway, I found myself up the wazoo today, and Dad is right: It’s not a place you want to be.